Understanding and measuring time is uniquely a human practice. Even though watches and clocks are ubiquitous in the modern day, quality design and craftsmanship are still widely appreciated. This unique timepiece is designed by the world's oldest watch manufacturer, Vacheron Constantin. 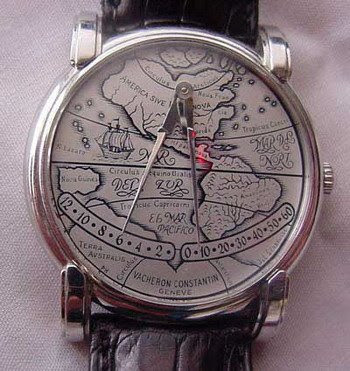 I was drawn to this interesting watch because of the highly unusual and unconventional hour and minute hands. 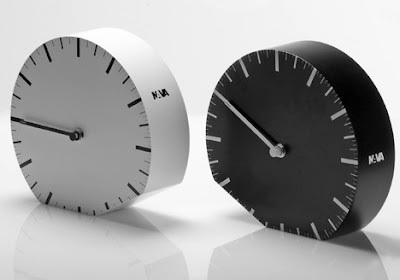 The hour hand on the left and the minute hand on the right move along the arc to indicate the hour and minutes, and return to zero after reaching 12 hours and one hour, respectively. The hands are made to resemble the needles of a mariner's compass, paying tribute to visionary cartographer Gerardus Mercator. Although this watch is made with the utmost quality artistry and materials, I would rather buy a sports car. Clocks help us keep time, which in the fast-paced world today, translates to keeping track of our daily appointments and events. 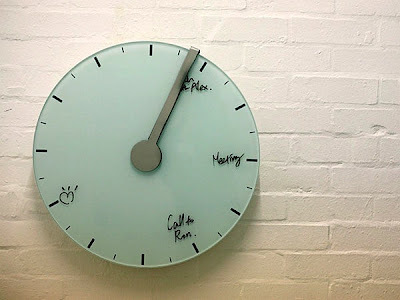 The Dry Erase and White Board clocks are two that were designed with similar concepts, but the White Board clock cleverly utilizes the moving arm to erase events as they happen. 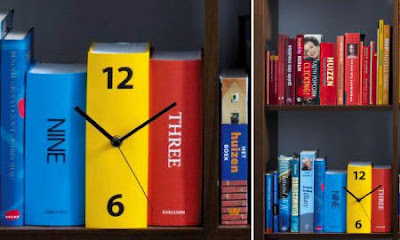 Some people prefer unconventional designs that don't involve numbers, or even look like clocks at all! 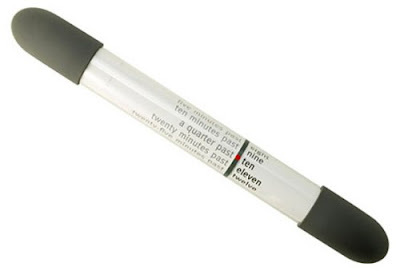 The Word Clock and the About Time Clock both tell you the time using words. 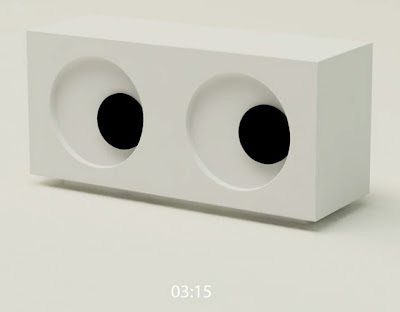 They are designed for those who think that they are too good for numbers, and wouldn't mind knowing that it's "about 3:00" instead of exactly 3:02. Others prefer clocks that use neither numbers nor words, but rather equations and symbols from which numbers are derived. 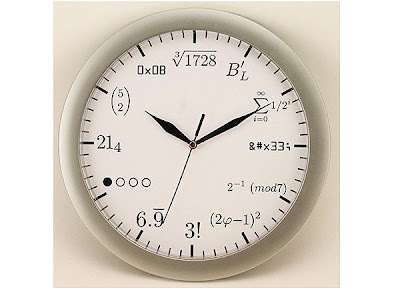 The Smart Clock reminds me of all the higher math I have never taken. Do the numbers on this clock make sense to you? 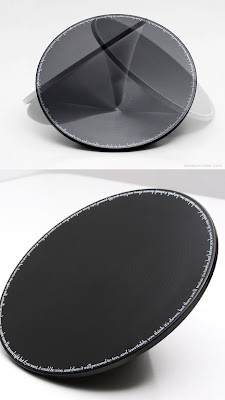 If yes, then this might be the perfect gift for your home, office, or physics lab. If not, you can still buy one just to confuse all of your guests. Ah, now this is a clock I can use! The On-Time Clock is a brilliant method for getting those of us who are perpetually late (*ahem*) to head out a whole 3 minutes early! 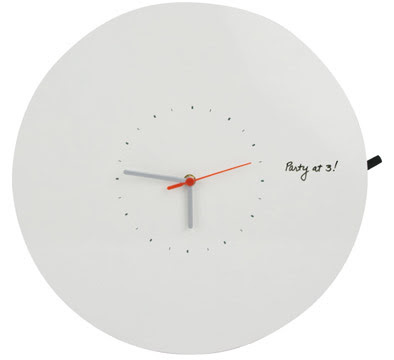 And for those who enjoy meta-themed art, the Clock Clock is for you. 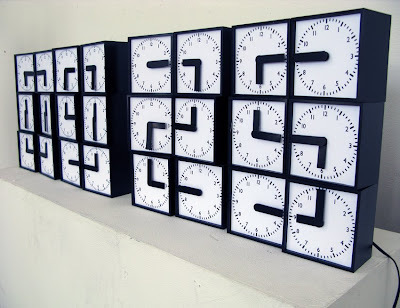 The display for each number is formed by 6 clocks and each of their two arms. There are people who would rather own a piece of art that inconspicuously tells the time, than a blatant clock on their wall or watch on their wrist. 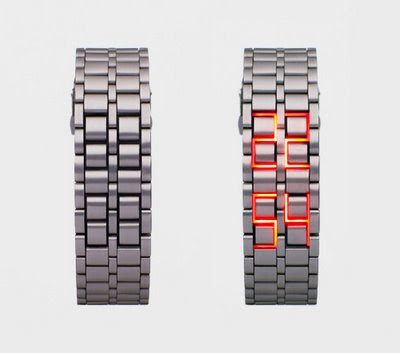 The Faceless Watch cleverly conceals the numbers in the groves of the wristband and appears as a normal piece of jewelry when the back-light is off, the Book Clock camouflages in with the rest of your shelf or nightstand, and the Eye Clock indicates time by the position of the spots, which correspond to the positions of the hour and minute hands. For those who enjoy a bit of modern decor, the Perpetual Wall Calendar would be a great addition to any home. I love the bold color and simplistic design, but one wonders if it can handle leap years, maybe even leap days? Yep—Daylight Savings. Simply tip it over and you're set one hour forward or one hour back; there's no need to adjust the dial. Looking back on these interesting designs reminds me of how humans are the only species that measures and partitions time the way we do. Some people prefer to know the hour down to the second, while others are comfortable enough with a rough approximation. Regardless of how we choose to do it, we all like to keep track of our time somehow. 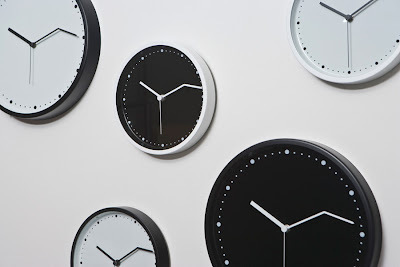 Do you have a favorite method to keep track of time? What kind of watch/clock/calendar do you use or would like to have? I really, really liked this article! Expensive time peices are neat to look at but, honestly? I'd be lost without my Fossil watch-- it's analog and digital so when I have two seconds to glance at my watch at work I don't need to worry about it and it gets a surprising amount of compliments to boot.